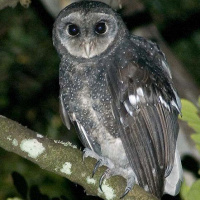 The Greater Sooty Owl is an elusive, medium large, sooty-black owl with no ear-tufts. They have also been known as Black Owls or Dusky Barn Owls. Bomb whistle - Jenolan, New South Wales, Australia. November 2013. CC Marc Anderson. Trilling - New South Wales, Australia. January 2000. © Deane Lewis. Description: The facial disc is greyish-brown with a dark greyish-brown rim. The face is paler towards the lower rim and darker towards the eyes and the base of the bill. The eyes are blackish and the bill is whitish-cream. The upperparts from the crown to the lower back are dark sooty blackish-brown, with fine white spots on the crown becoming larger towards the back and wing-coverts. Flight feathers are uniform dark greyish-brown with some indistinct darker bars. The tail is similar with more distinct bars. Underparts are greyish-brown, paler towards the belly, with small whitish spots and mottling. The feet are densely feathered pale greyish-brown to the base of the bare greyish-brown toes. Claws are dark brown. Size: Length 37-51cm. Wing length 243-353mm. Tail length 115-145mm. Weight 500-1160g. Females are larger and heavier than males. Habits: Strictly Nocturnal. 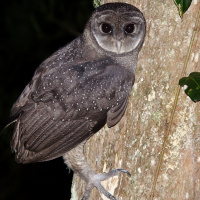 Hides during the daytime in crevices, hollow tree trunks, dense foliage of tall trees, and sometimes caves. Voice: The characteristic call is a piercing downscale shriek, lasting for upwards of two seconds. It has been likened to the sound of a falling bomb without the final explosion and the call is now widely known as the 'bomb whistle'. Adults also utter a piercing trill. There are also various other calls associated with breeding and nesting, including a soft chirruping trill. 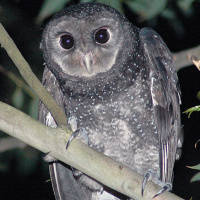 Hunting & Food: The Sooty Owl is a powerful hunter and takes some remarkably big prey, a high proportion being arboreal. 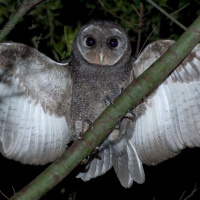 This contrasts not only with the lesser Sooty but with all other Tyto Owls, which take most of their prey on the ground. 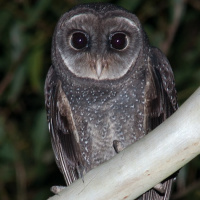 The huge eyes of both sooty Owls compared with other Tyto Owls suggests a greater reliance on vision. Sugar Gliders and Ringtail Possums make up a high proportion of the prey but a wide variety of other mammals have been recorded. There are no records of hunting methods. The male does all the hunting during breeding and usually brings one large prey item per night. Breeding: The season is variable, with most eggs laid from January through to June but there are some records of laying in spring (August-September). Males often become more noisy at the start of the season, giving frequent 'bomb whistles'. The male feeds the female in the hollow, engaging her with soft, high-pitched trilling before passing over the prey. The nest is usually in a large hollow in a living tree at any height from 10 to 50 metres. There are a few records of nesting in caves. Females occupy the hollow for many weeks before laying, flying out only briefly during night. A female in a cave nest site rarely leaves at all. 1 or 2 dull white eggs are laid, measuring 44-52mm x 36-41mm. Incubation is around 42 days. 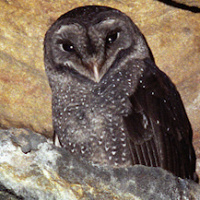 The young are covered in sooty grey down and are fledged in about 3 months. 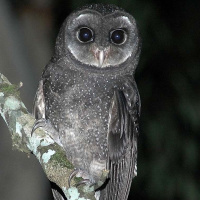 The newly fledged Sooty Owl is dependent on its parents for up to a month. Habitat: Deep moist gullies in eucalypt forest, usually with big, old, smooth-barked gums and an understorey of tree ferns and Lilly Pilly. They may move into drier forest to hunt but they need the primary habitat for roosting and breeding. They are Territorial and sedentary throughout the year. 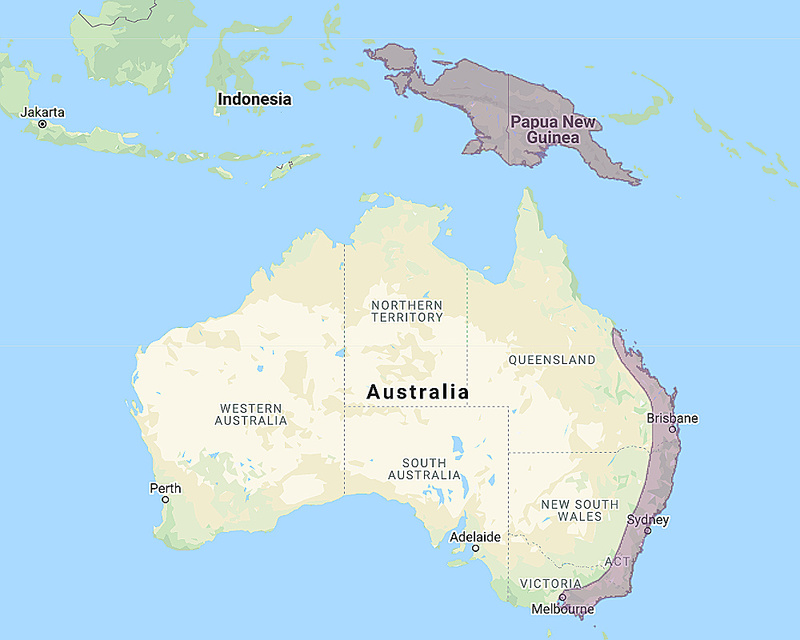 Distribution: Coastal and mountain regions of south-eastern Australia from the Dandenong Ranges near Melbourne to the Conendale Range north of Brisbane. Reportedly present on Flinders Island in the Bass Strait. They are also found in the Montane rainforests of New Guinea. Original Description: Gould, John. 1845. Proceedings of the Zoological Society of London, pt. 13, no. 149, p. 80.